Hasselblad X1D-50c Medium Format Mirrorless: Is it Worth the Price? Most photographers go a bit weak at the knees when it comes to Hasselblad cameras. Medium format sensors and top quality is the name of their game, but outside of the studio, they are not always the most complete, well-rounded cameras. The Hasselblad X1D-50c marks a more compact design, still compatible with Hasselblad HC and HCD lenses, and a unit you should be able to take anywhere with its mirrorless design. A big selling point with this camera is the 50MP, 44 x 33mm sensor which works out being 70% bigger than de facto full frame sensors. And the bigger sensor equals bigger quality in general terms. To keep things compact, Hasselblad has put the shutter into the lens, which means that it will sync with a flash no matter the speed you set. The sensor is similar to those found in the Pentax 645Z and the Fujifilm GFX 50S, but the Hasselblad design is far more compact, with a sturdy design made out of one block of metal. This definitely gives the camera an air of high quality, which you would expect when you check out its price tag. The X1D-50c is compact, with minimal controls and a twin-dial design. There’s enough grip to feel comfortable, and the most used controls are easily at hand. 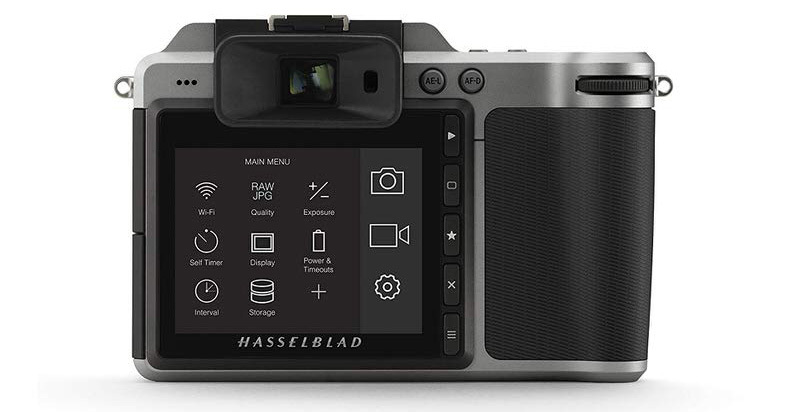 The design feels both old school and new at the same time, being familiar to both current Hasselblad owners and those venturing into this market. Some nice features include a touchpad AF point selector, with each point easy to choose as well as which region of the screen is active at any one time. The downside to this is that the AF/MF button must be held down as another route to AF point selection. If you want to choose AF points, stick to the touchpad method. The battery is a bit of an odd unit, not anything standard. It doesn’t have any official figures for its lifespan, but battery life isn’t that great, so it’s recommended to buy a few of these, just in case. If you’re looking at lenses for the XCD system, you have a choice between the f/3.5 30mm, f/3.5 45mm f/3.5, f/3.2 90mm, f/4 21mm, and f/3.5 120mm macro. Two more are in the works, which include a 28-60mm and a 65mm prime lens. Being a Hasselblad and a medium format means that this camera is not going to cover all bases equally well, but it can guarantee top-notch image quality, especially if in the studio. The autofocus is slow, but very precise when it’s in focus. A 1.7 frame per second shooting time means anything fast moving may be missed, but what you make up for is great quality every time. In other words, landscapes, portraits and a compact design for travel will be the key areas here. It may be just a little too slow for sports and wildlife. Just like any other Hasselblad products, what you’re getting here is incredible levels of detail, fantastic dynamic range, and great resolution. Noise levels are can be compared to the Fujifilm GFX and a Pentax K-1. ISO invariance which uses hardware amplification at high ISO settings, meaning the dynamic range doesn’t drop by one EV for every one EV increase in ISO. This equates to meaning lower noise in dark conditions, with extra detail. Video quality is compatible with the competition at 1080/30p. No 4k video here, but this camera is really intended for still images, that is the selling point. The pop-up mode dial makes it easy to select different modes, but the shutter button can be quite sensitive, so watch your trigger finger. You get focus peaking for orange, cyan, yellow and magenta colors, with the option of a live exposure preview in M mode. You don’t get a live histogram, which is a shame. The histogram is only available when in playback mode. The menu on the X1D is simple and straightforward with the ability to customize to your needs. Coming from a leaf shutter design, you get a few unusual options like the Maximum Aperture, Full and ‘True Exposure’ mode. Auto ISO can be chosen with lower and upper settings, but it is quite basic, with no option in manual mode, no matter if you are taking regular images or video. The Mq Quick Manual mode is interesting as it is there to save power and reduces shutter lag while disengaging in view. It’s probably a feature that will only be used on rare occasions. The three closest camera comparisons are going to be between the Fujifilm GFX 50S, the Pentax 645Z, and Nikon D850. The Fujifilm is a larger unit, with better battery life, with the image quality comparable to the X1D-50c. Being also a bit faster than the X1D-50c, it may be more suited to being more an all-around camera. The Pentax has a full 645 format lens with a greater range of lenses. The Nikon has the advantage of ISO 64, with slightly less resolution than the X1D-50c. However, being a Nikon its more a well-rounded camera, less money and has a bigger range of lenses. The Hasselblad however, is the lightest to carry around of the bunch. You can think of the X1D-50c as a more compact version of one of its larger brothers from Hasselblad and with those bodies and lenses, once the thing is in focus, the images are hard to rival. The company is still very good at keeping its firmware update, which means discrepancies like the basic auto ISO could be updated in the future. This unit is a premium product, and those who can afford a more compact version of an existing Hasselblad may buy into this camera just for a more compact unit that provides premium images. The camera boasts wonderful images, in a compact design, but it’s not the fastest kid on the block.